My next interview in my spotlight blog series on the current Aurora Award ebook bundle is with Michael Rowe on his vampire novel, Enter, Night, a finalist for the Aurora when it came out. He is also the author of the novels Wild Fell (2013) and October (2017.) An award-winning journalist and essayist, he has won the Lambda Literary Award, the Queer Horror Award, and the Randy Shilts Award for Nonfiction. Here are Michael's answers to his interview questions. If I had to pick the character I most enjoyed writing, it would be Adeline Parr, the monstrous matriarch of the town of Parr’s Landing. Hands down. I’ve always had a soft spot for female monsters and anti-heroines. Women in horror have been so often depicted as victims in need of saving, particularly in traditional vampire fiction. I prefer them as powerful entities that can look after themselves, and then some. There was something tremendously exhilarating about writing a character as emotionally carnivorous and all-powerful as Mrs. Parr—she says whatever terrible thing she wants to say, whenever she wants to say it. She wields her money and her power with equal ruthlessness and cruelty against her family and against the town. She’s old gold mining money, and she has an almost feudal relationship with the town her family founded and named. She has no discernable moment of redemption, and by the end of the novel she’s only been transformed into the creature she really already was. She was an absolutely blast to write. Long before the actual vampires make their appearance in the novel, Adeline Parr is already the queen regnant of the monsters. The relationship between the teenagers, Finn and Morgan, is my favourite of the relationships in the novel. There’s a great deal of the young me in Finn. Morgan is an amalgam of the teenage girls I knew at that age, and parts of the relationship mirror my relationship with a former babysitter, Nancy, whom I eventually came to regard as a big sister—a relationship, by the way, which continues to this day. When I was writing Enter, Night I was very conscious of that particular relationship and all its nuances. Of course, their relationship takes off in directions mine with Nancy never went, but there are echoes of it all throughout the book. A close second in the relationship department would, of course, be the relationship between Jem, who returns to Parr’s Landing as an adult gay man, and his first lover, Adrian, who is now a local cop. While Jem has chosen to live his life in the open, Adrian remains deeply closeted and full of self-loathing. The interpersonal dynamics in that relationship were surprisingly poignant to explore, particularly since they had loved each other as boys. In Adrian’s case, that love was brutally snuffed out by Adeline Parr, who sent Jem away for reparative therapy and forced Adrian’s father to cruelly punish his own son. What struck me the most about that relationship was that even though it was set in 1973, the particular conflicts it presents still exist today in repressed pockets of North America and elsewhere. There is a scene midway through the book between Finn and his black Labrador, Sadie, which utterly gutted me. During the writing of Enter, Night my own Labrador, Harper, was living through what would be his last year. A great deal of my anxiety and anticipatory mourning went into that scene, and indeed manifested itself throughout the relationship between Finn and Sadie. That said, it was essential to the novel, and it had to be written exactly as it was. It’s quite unprecedented in vampire fiction and no one seems to have ambivalent feelings about it. 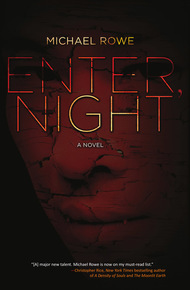 Enter, Night is actually two books. The novel proper forms the bulk of it. The second book, which appears at the end of the main story, is a novella that serves as a sort of backstory for the events that unfold in 1973. It’s presented in the form of a “relation,” the long accounts the 17th century Jesuit priests wrote about their lives and work in New France. In this case, the relation is an account by Father Nyon, a young 17th century French Jesuit priest who is dispatched to the wild interior of the country to ascertain the fate of a Jesuit settlement, St. Barthélemy, from which all communication has ceased to flow. While an Iroquois massacre is suspected, the truth is much darker and much more terrible. There is a scene near the end of the novella that finds Father Nyon—freezing, starving, half-mad, his faith worn raw—facing off against the creature that wiped out the settlement of St. Barthélemy. He confronts his own shattered faith and his dreadful realization that the monsters walking the forest are more real than any angels he might have previously fathomed. Particularly, it deals with his dawning awareness that he and his fellow missionaries have very done irreparable damage to the First Nation tribes with whom they had interacted, and whom they intended to bring to Christ. It addresses how fragile is the arrogant fantasy of being a divine emissary on a mission to save souls while leaving destruction in one’s wake. Is there something in this book that you consider to be particularly Canadian or that Canadians would relate to or recognize in terms of sensibilities, worldview, societal beliefs, etc.? The entire novel is unabashedly Canadian. It couldn’t be more Canadian. When I was a teenager away at boarding school, we canoed from Thunder Bay to Lake Winnipeg, which is a distance of approximately 900 miles. We did it in three weeks, following the old voyageur routes, including one brutal 9-mile portage, carrying waterlogged 400-pound wooden war canoes on our shoulders. We lived some of the history that informs the novel, particularly the latter section. The landscape of Enter, Night was born of those impressions of the raw beauty of the Northern Ontario interior as experienced by an awestruck 15-year old. In addition to the traditional vampires, there are also metaphorical ones—the parasitical destruction of the northern Ontario environment in the form of strip mining and the ruthless exploitation of the town’s citizenry in the service of the mine owners, the bigotry of class-conscious small Canadian towns, the historical eradication of First Nations cultures through colonization—from the illnesses brought by European priests, to the residential schools, to the anti-First Nations prejudice that still flourishes today, both openly and in the form of the “polite,” hierarchical Canadian racism of people who would insist they weren’t prejudiced in the slightest. In addition to 70s-era Toronto landmarks, I used a 1973 map of Northern Ontario to set out the landscape of the novel, and anyone familiar with that part of the world will hopefully find him or herself in the book without too much trouble. I used several soundtracks repetitively during the writing of the book, including Johan Södervist’s score for Let The Right One In. There is one scene in the book in particular which I can no longer read without hearing the track “Eli’s Theme.” Likewise, Michael Giacchino’s stunning score for the American remake, Let Me In. I used Damon Albarn and Michael Nyman's score for Ravenous for the sections detailing the madman Richard Weal’s hunt for the vampire entombed in the caves above Parr’s Landing—the music carries more than a hint of insanity and derangement to it, which made it perfect for those scenes. Christopher Gordon’s soundtrack for the 2004 remake of Salem’s Lot was perfect writing music for this project, particularly the haunting “Salem’s Lot Aria,” with the eerie solo soprano vocalist. I also listened to a lot of Gordon Lightfoot. I’m a huge Lightfoot fan, and his music always seemed to me to embody the rawness of the Canadian small-town experience, particularly in the era in which the novel is set. Lastly, Nathan Rogers’ “Hibbing,” from his album True Stories was the crown jewel of the writing of Enter, Night. This haunting, soulful song, about a young man’s bleak choices growing up in a small Minnesota mining town, seemed to embody one of the novel’s core themes—to either escape from a life preordained by social class and lack of opportunities, or be crushed by that life. The line “there are two ways out of Hibbing / on the Greyhound or down the mine” is heartbreaking. Losing myself in the writing of it. I’ve now written three novels, and I didn’t have the experience with either Wild Fell or October that I did with Enter, Night. It might have been the fact that it was my first novel, but the characters became as real to me as people I’d actually known. Even today, if I catch myself daydreaming about Parr’s Landing, or Jem, or Christina, or Adeline Parr, or Finn and Morgan, or even Sadie the Labrador, they feel more like memories of genuine encounters than characters I created out of whole cloth. Even the town of Parr’s Landing and the cliffs and caves above is a places that feels real to me, and which I can picture in unvarying detail. Honestly? My biggest surprise is I managed to write it at all. It was one hell of a slog at times. I thought I’d write a neat little 80K word vampire novel and make everyone happy. Instead, I turned in a sprawling 120K-word mosaic with multiple characters and multiple perspectives, plus a novella written in from the first-person point of view of a 17th century French Jesuit priest tying it all together. The second biggest surprise is that people seem to like it. I was convinced that Enter, Night was an unwieldy albatross that would sink my publisher under its weight. It’s turned out rather differently, thank God. Thanks, Michael. Folks, check out the Aurora Award bundle up at Storybundle until August 9. Some of the best in Canadian speculative fiction at a great price.